If Not Whom, Then What? 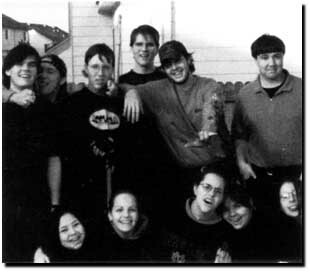 Members of the Trenchcoat Mafia posed in the 1998 Columbine High School yearbook (from the Denver Post). It was the early 1970s and, in the very affluent Memorial area of west Houston, two parents were getting worried about their son. Although previously he had taken off for a day or two without saying where he was going, this absence had stretched into a fifth day. The police were notified, but, with the child's history and the parent's deliberate low-key concern, only perfunctory inquiries were made. With no word by the end of a week, the alarm bells of parental panic went off. Still, it was only after another full week that their son reappeared, but, not by his choice. He had been living in a friend's back bedroom in a large rambling house in which that child's privacy was honored and never violated by 'snooping' parents. As he often ate in his room, it was easy to take food to his friend. The maid knew the friend was there but visiting friends were not that unusual. Only the increased frantic search made his friend tell the parents and authorities where he was. If not the parents, whom do we blame? A good case can be made that the reported verbal ridicule, tossed baked potatoes in the school lunchroom, and other harassment by the athletes--a 'safe' suburban form of the inner-city gang--bred a deep, burning resentment in the boys. Still, if such harassment were the cause, shootings at schools would be a weekly occurrence somewhere in this country. If not whom, then what? Parents in a previous school shooting are now suing video game makers. A person who teaches soldiers to overcome their natural inhibition to kill others, reports that the video games replicate the techniques he uses. Yet again, with the millions using video games, why are there not more youth transferring their video game skills from images to fellow humans? Charlton Heston, current President of the NRA, is clear about what to blame--those long "deadly" coats the boys wore (and the parents who let their children wear them). Certainly, Heston believes, the guns are not the cause. On a narrow point of argumentation he is right, but the deadly force of guns in the hands of two teenagers to kill 13 and injure 24 makes his apologetic for guns a dogmatic absurdity. For an answer, I turn to William Golding's 1954 classic tale, Lord of the Flies. A group of English schoolboys are plane-wrecked on an unpopulated island, and the situation deteriorates as the trappings of civilization fall away. They confront not only the defects of their society but also the defects of their own nature. Although not a popular explanation, I believe there was a defect in their nature. Even so, what is so frustrating and unnerving is that we will never know precisely why Eric Harris and Dylan Klebold made so many others the object of their inner rage. We do know the enormity of the evil.